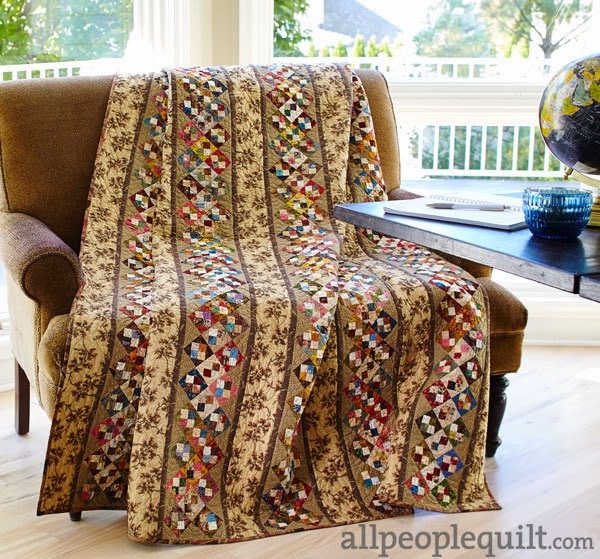 APQ Quiltalong – Go Four It!! It is that time again for a quiltalong. As you may know last year I was fortunate enough to have one of my quilts featured as the first APQquiltalong. (see here) I am more than thrilled to be back this year with a few of my friends joining me. Edyta Sitar of Laundry Baskets Quilts and April Rosenthal of Prairie Grass patterns have both created 4 patch quilts, so the talented brains at APQ named this article, Go Four It! Edyta Sitar, the queen of scrap has created this incredible quilt with the te-tiniest rainbow of prints and batiks. It is kind of funny how this all came to happen and I wanted to share a bit of the back story. One of the editors at APQ, Elizabeth Tisenger sensed a trend of four patch quilt projects during her quilt submission process. Instead of choosing, she thought what the hey, each one is so different in size and construction, let’s feature them all. February 3rd for the complete instructions on all 3 versions. So now it is up to you to pick your favorite technique and design, choose your fabrics or use this project as a scrap buster and quiltalong with us. Be sure and share your progress with us by using the #APQquiltalong. I also have a pinterest board where I post as many pics as I can find across the world wide web. Here are just a few of the quilters that you will want to follow along as they share their version of the #APQquiltalong. 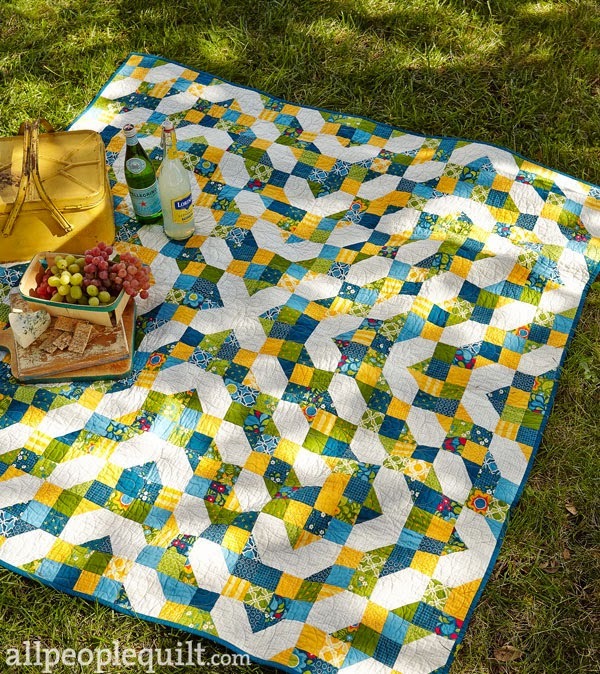 Bonnie Hunter, Quiltville’s Quips andSnips! Oh! you naughty ladies! More temptation to start new quilts! So excited for this. Starting sorting through my Moda Candy today 🙂 What fun!!! I'll definitely be joining in again – I loved making "Tone it Down" last year. I love them all, and I'm already a subscriber. Can't wait to get my copy! Oh I want to make one just like the first picture (that one is yours isn't it?) – so soft, so scrappy, so wonderful! Off to search my stash for background prints. Can't wait to get my copy of APQ this month! 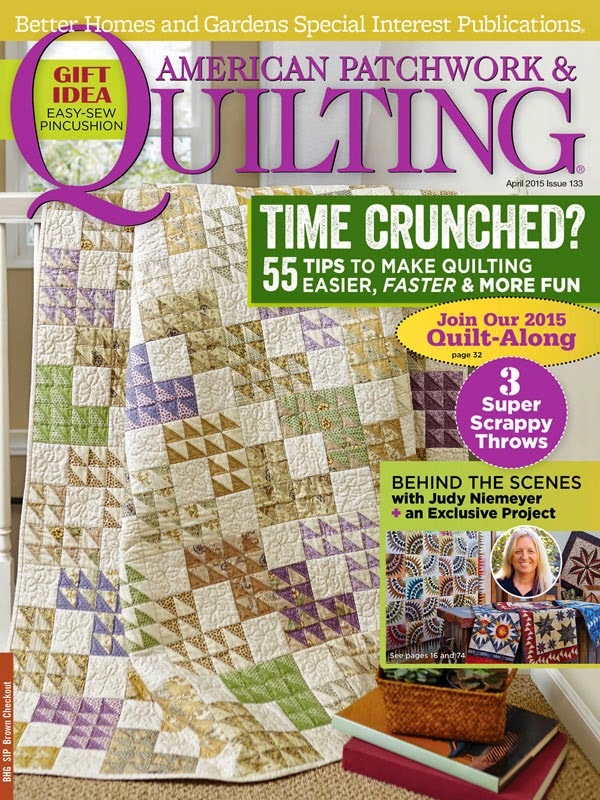 Ah so sad we don't get that magazine here in the Netherlands otherwise i would have joined the quiltalong. I love your version the best and really wish I had the time to squeeze this in. I have more than enough scraps to bust too. 🙂 I'm going to keep considering my deadline schedule to figure out if I can play along too.